I stopped by one of the newest additions to the Disneyland Hotel complex. 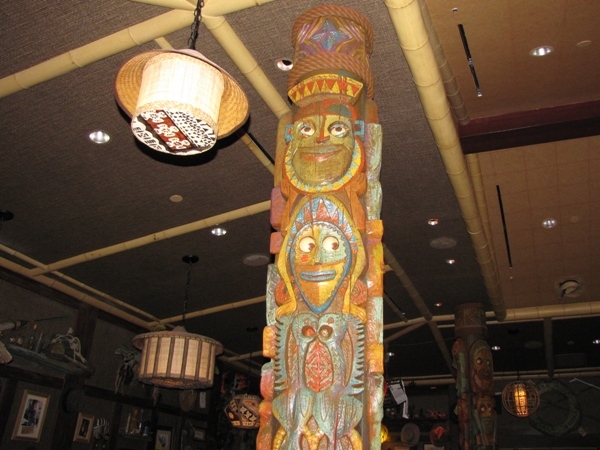 The Disney web site officially calls it “Trader Sam’s – Enchanted Tiki Bar”. 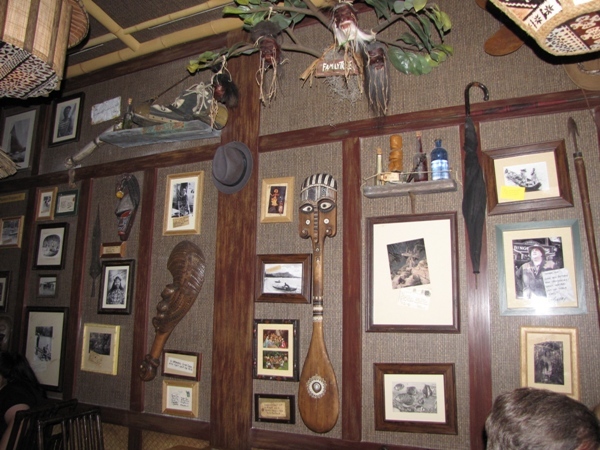 Trader Sam’s is a tropical inspired lounge that is located on the far end of the Tangaroa Terrace restaurant. I’ll make a small prediction here; this place is going to be very popular. 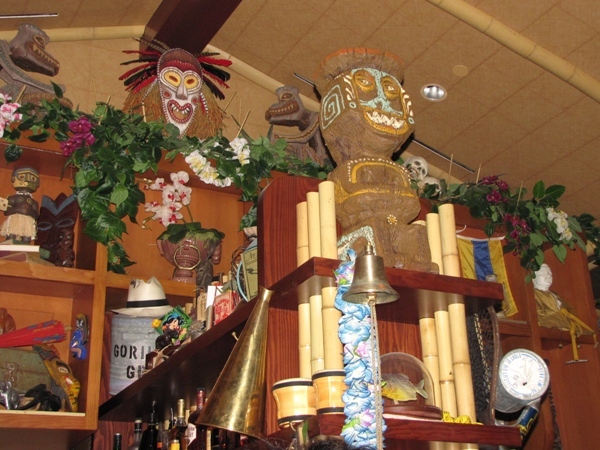 Trader Sam’s fits right in with the continuing refurbishment at the Disneyland Hotel. 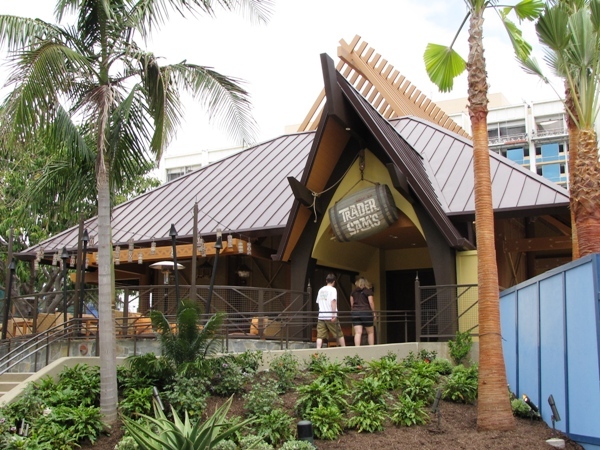 The Tangaroa Terrace / Trader Sam’s complex sits right across from the new pool area in between the main room Towers. 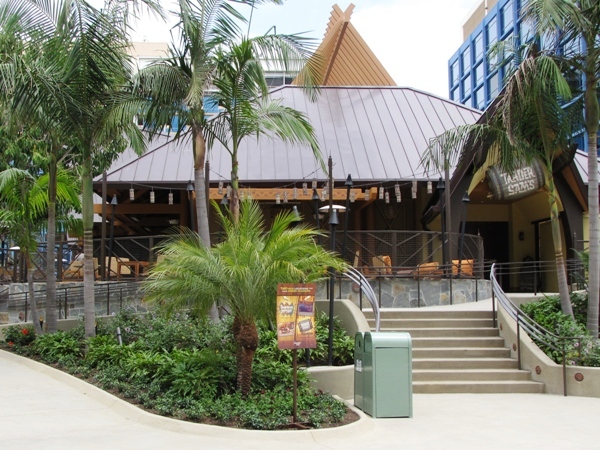 Tangaroa Terrace and Trader Sam’s share a common outdoor deck, but as Tony Spittell pointed out, there are distinct areas for both facilities. The island theme is wonderful. 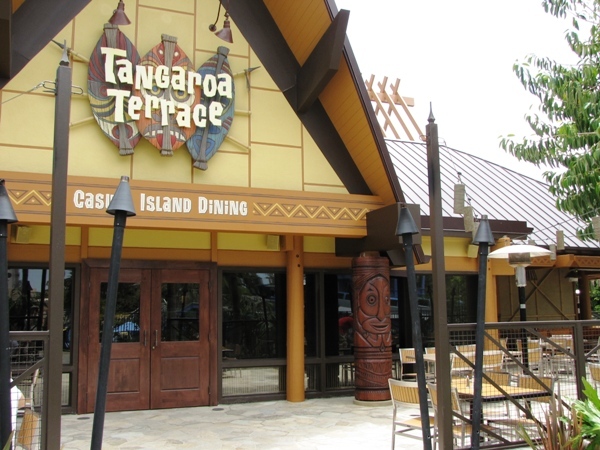 See Tony’s blog for a full description of the Tangaroa Terrace restaurant. 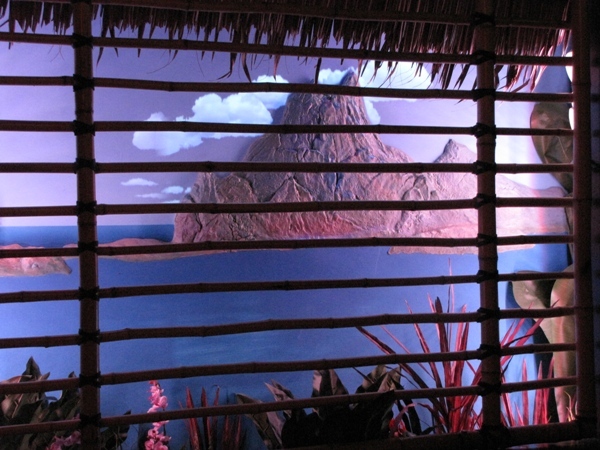 Image: Tangaroa Terrace. Trader Sam’s is on the right side around the corner. 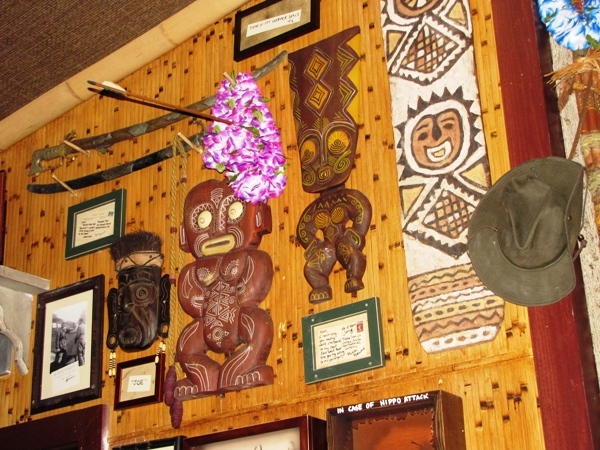 From the moment you open the door to Trader Sam’s you are immersed in a tropical paradise retreat. Island decorations and trinkets are everywhere and cover the walls. 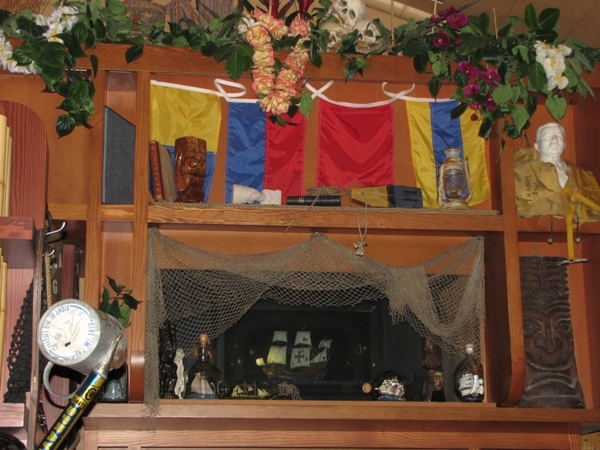 Many tributes to the Adventureland section of Disneyland are represented inside Sam’s. In fact, the nearby Dreams Tower will soon be renamed the Adventure Tower in keeping with the whole Adventureland theme. 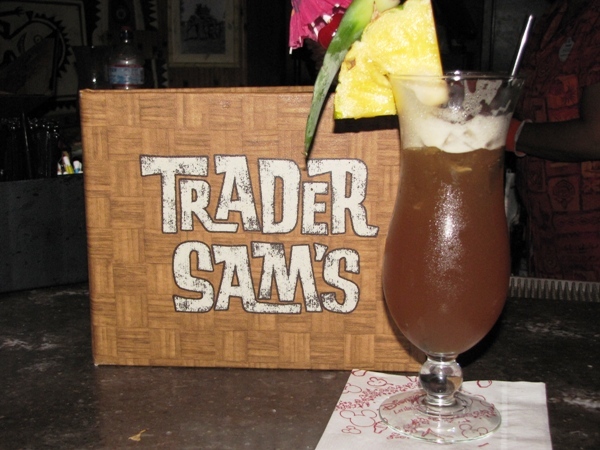 The name for Trader Sam’s comes from the character at the end of the Jungle Cruise attraction. You know, the merchant who offers you “two heads for one of yours”. Well it seems that Trader Sam has set up shop and is now dealing in all kinds of exotic treasures. There are surprises everywhere and many things to explore on the walls and shelves. 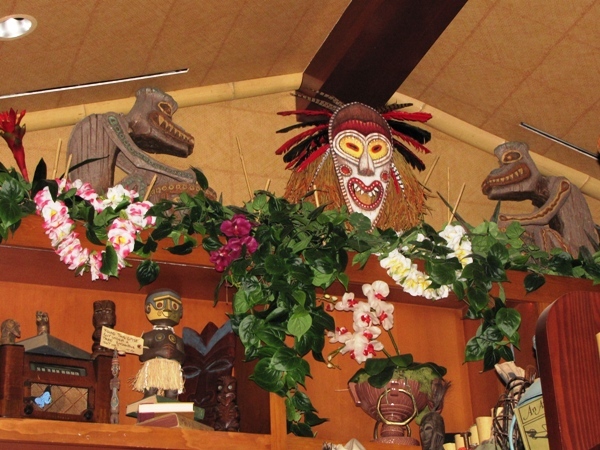 You can find items from the Enhanced Tiki Room attraction and many other items typically found around Adventureland. Every so often, an item in the room springs to life. You never quite know what is coming next, but it’s fun to look around the room and try to figure out what may happen. You never know if the pleasant scene out the “window” will turn into a tropical storm or the ship in the bottle will be “lost at sea”. It’s fun and really gets the whole place going. Trader Sam’s is primarily a bar with a nice selection of specialty cocktails, each with a tropical flair. Some of them even come with a “light up” surprise. I tried the “Lost Safari” ($9.50) which is a nicely done rum based drink with tropical juices. Other specialty cocktails include the Uh Oa!, Krakatoa Punch (a popular choice), HippopotoMai Tai (love the name), Shrunken Zombie Head, Mosquito Mojito, Tiki Tiki Tiki Tiki Tiki Rum and many more. 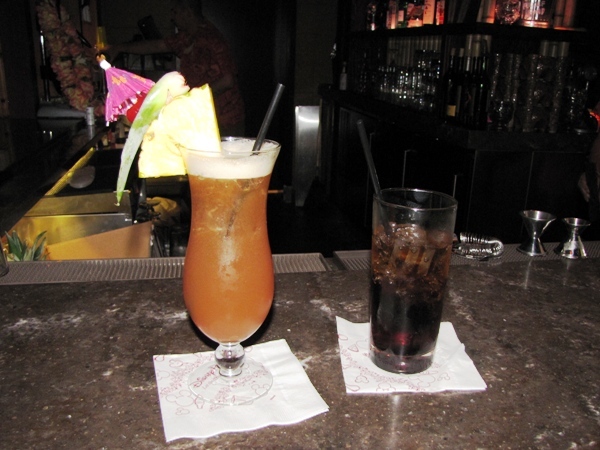 Many are mixed with Sam’s secret blend of tropical juices called “Sam’s Gorilla Grog”. I thought the prices were quite reasonable (for a Disney resort). Many of the specialty cocktails also come in a souvenir glass or mug that you can take home. There is also a full line of the traditional cocktails, beers and wines. There are also plenty of non-alcoholic beverages including some specialty ones like the Schweitzer Falls, Jungle River Sunset and Skipper Sipper. All have tropical juices, flavoring and some kind of soda. There is also a nice little “bar food” menu which will serve nicely for a light lunch or late evening snack. The items are tropical themed and are in keeping with the new style of serving interesting alternative dishes. Items include the Tamarind-glazed island pork “wings”, sweet and spicy Asian wings, fish tacos, Panko-crusted Chinese long beans, chicken lettuce wraps, Ahi poke, and Kalua pork flatbread. I tried the chicken lettuce wraps ($9.99) and they were excellent. (Sorry, no picture available.) Your platter comes with a preparation of spiced minced chicken, some rice noodles, a dipping sauce (very good) and a cup of nice little lettuce leafs. You get to prepare your wraps and dip to taste. These were great! There is also a great little treat called “Trader Sam’s dessert flight” ($7.99). 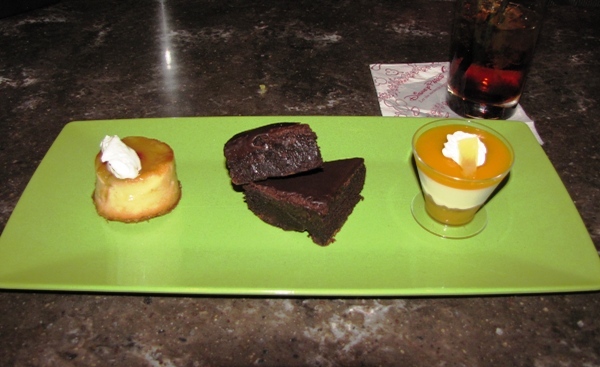 This consists of three small servings containing a pineapple upside down cake, a cappuccino-chocolate chunk brownie and a small fruit parfait. I thought all were excellent (although not traditional). 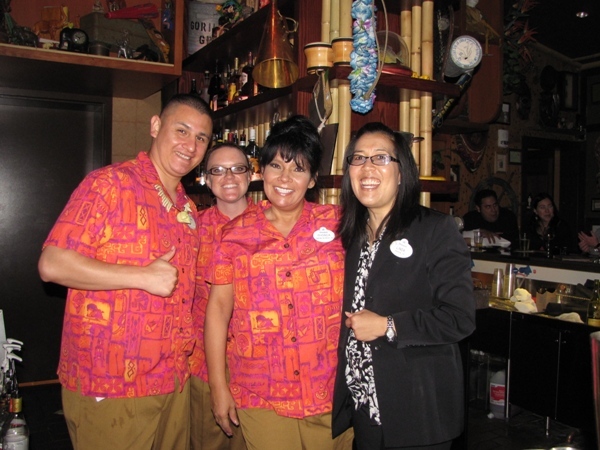 I must mention Trader’s Sam’s staff. The cast members were excellent and worked very hard. Not only were they tasked with preparing the beverages and serving guests, but they also participated in the “entertainment”. Top marks, you guys! The seating area inside Trader Sam’s is limited. There is seating around the bar itself and several tables around the room. But overall this is a small facility and will only seat about 50 people regularly. There is some standing room but not much. There is outdoor seating, but all the action will be inside. As I said, I expect this to be a popular place, so we may see some lines in the evenings to get in. I give Trader Sam’s at the Disneyland Hotel top marks. The food and drink is excellent, the atmosphere wonderful and the added special effects makes Sam’s a great experience. In fact, this may be one of my new favorite places!